Russian and Turkish ‘banyas’ of Brooklyn provide a little rough relaxation on a winter’s day. I dutifully obeyed. You do this in the smothering steam of a Russian sauna when a man approaches you clutching a thicket of fresh oak leaf branches. You follow because you are dressed solely in a swimsuit, woozy from the prickly heat and eucalyptus vapors aswirl in the air, and because, with a crowd of Russians staring, you don’t want to look like an American wimp. I slunk onto the towel spread on the hard benches in the wood-lined room. The air was briny with sweat and the yeasty scent of burped beer. I instinctively covered my head. Alex Dolgolevsky, a man I had met only an hour before, repositioned my arms by my side and instructed me to kick off my plastic sandals. Standing over me, he shook the branches like a talisman. Droplets of water sizzled on my back and evaporated in a blink. “Are you ready?” he asked in a heavy Russian accent. I held my breath and focused on one thought: I bet they don’t come after you with tree branches at Canyon Ranch. There is just no equivalent to a Russian steam bath. Be it called a banya or bania in Russian or a shvitz in Yiddish, Russian baths offer the Zen calm of their Finnish and Japanese counterparts, with some hearty Slavic energy. Spend a day at one of New York City’s bathhouses and you experience a welter of contradictions: pain and pleasure, fear and calm, searing heat and Siberian cold. Not to mention a rather twisted notion of maintaining optimum health. Right now is the time to discard all notions of mud packs and plush towels and sliced cucumbers alighting on your eyelids. The banya ritual in Brooklyn is more of a do-it-yourself experience echoing pagan, pre-plumbing days when communal sweating was the only cleansing option. And soap was really rare. There are some differences from bathing in the old country. Russia’s historic bathhouses are opulent temples of gilt and marble, far grander than the simpler structures here. And New York baths are coed, to the discomfort of many older Russian women. In spite of everyone’s scanty dress, though, a banya ritual is a spiritual retreat, not a sexual playground. A woman might draw a few winks, an offer of a massage, but nothing more. New York spas, in keeping with the polyglot culture, offer a range of ethnic bathing styles: Slavic dry heat, wet Finnish saunas and the water-dousing common in Turkish baths. But in every other way the regimen is decidedly Russian — the bonhomie, the hot tea, the sweaty plunge into cold water (or, when available, snow), and the dumplings and shish kebabs and rich soups. And, yes, the vodka shots. The Russian-Turkish Baths are favored by Turkish emigres, religious Jews and post-Soviet yuppies. The heat in the Russian room is not very intense. (Some think it’s downright cool.) The main attraction is the Turkish spa. Small and brightly lit, lined in part with cut stone, the room has several spigots that shoot cold water. One Saturday night everyone agreed that the oven along the wall needed reviving. The banshchik, or attendant, opened the door and ladled water on the hot stones. A Santa Ana wind blew through the room. A young man hoisted a bucket of icy water and dumped it over his head, dousing me as well. I screamed, then tried it myself. Russians believe the shock forces toxins from the body. “It’s exercise for the cells,” said Boris Kotlyar, owner of the rival Mermaid Spa. Peace-seekers flock to the Mermaid. Tucked just outside the Hasidic community of Sea Gate, near the festive Russian strip of Brighton Beach, the Mermaid’s owners have just put an $800,000 face-lift on the place. Besides three Russian banyas the spa has a scorching dry sauna, a Turkish bath, a whirlpool and two small but deep tile pools that are machine-fed with chipped ice. 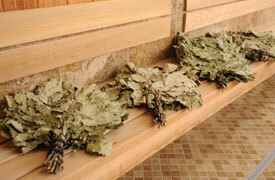 You can have a massage or a venik treatment, literally a broom scrubbing with oak or birch branches soaked in water. But strangers will offer to scrub each other, and in the communal spirit of bathing, why not agree? My limbs felt loose and rubbery, my heart pumping like a piston. The banya, I realized, is about suffering for your redemption. You slog through the heat, you weather the cold, you imbibe strange smells not always associated with cleanliness. Mostly there’s the pain, the blessed pain, that keeps everyone coming back for more. I looked at Alex with glee and agreed.